The school season has just begun and as students move their way to the next round of classes, so do we move on to the next round of games. There are plenty of titles coming out in the Fall season that can make one forget their studies. Before you get into the meat of the holiday gaming season do not pass up on the excellent Hatoful Boyfriend. I was looking forward to this Japanese visual novel and was very pleased with how the game turned out. When you first look at this game it is easy to think that you will spend most of your time bird watching rather than engage in an epic adventure. This game is no bird watching simulator, it's a game where you try to find your true love which just so happens to be a bird. Yes, a BIRD. You play as a human girl starting her second year at an all-bird high school called St. PigeoNation’s Institute. As strange as the story appears at first, it only gets wackier which is where the game excels. The story and characters are all very original; an undercover pigeon-spy, mysterious professors and a pigeon-biker gang. You honestly cannot explain the game without causing a reaction. 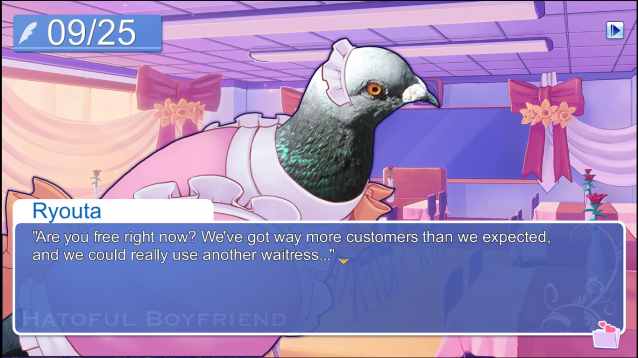 The core gameplay of Hatoful Boyfriend, revolves around clicking through dialogue and making choices throughout the game. A good feature the devs included was the ability to fast-forward through dialogue. While you will want to pay attention to new conversations, this ability helps speed up what you have already been through. Another aspect that is clutch is being able to save on the fly. The save option allows you to go back before your key decisions and helps eliminate wasted time. Overall the game takes just over an hour without skipping dialogue, but with about ten endings these two key features help give you more incentive to replay through the game. Having the ability to skip dialogue and pick up where you saved last are great ways to pull you back in for another playthrough, but really it is the story that will bring you back for more. I really did not think the game would have much to offer besides a gimmicky storyline about birds and you falling in love with one. As you start to make your choices and decide which bird you fancy the most, you begin to realize that each birdie harbors secrets. Every character’s dialogue starts out as a seemingly normal conversation, but with one or two discrepancies that are out of place. By carefully picking your agenda and routine for the day, you not only start falling in love with a bird but also learn more about their mysterious life. One fault that I do find in the game is the ability to actually lose the game . I suppose not everyone finds the bird they are meant to be with their second year in high school, but how the game ‘fails’ is a bit peculiar. It all comes down to how you form a relationship with the bird you desire and the ability to pass at school. If you get down to Legumentine Day, the day you give beans to your lover, without a significant other or one that you have been trying to please, you are kicked out of school and fail the game. These heartbreaking moments are mitigated by a save system but figuring out what went wrong is kind of frustrating. Not to mention the stat-system is hard to understand. Whatever the romantic outcome may be, the path that takes you to the conclusion is always grand. I really cannot get over the situations in this game. It falls hard on stereotypical school boys, a jock, book nerd and popular guy, but the way each of their stories’ pan out makes them more dynamic than they first appear. The writing is one of the strongest points of the game. There are clever puns with the author using ‘nobirdie’ and ‘everybirdie’ in place of words. There are the occasional translation hiccups and regional holidays that you have no clue what they are, but the translation adds to the zaniness and the holidays are cool to learn about. Overall this game is perfect for pick up and put down play. I played it on the PS4 but having the ability to cross-save with the Vita is a nice touch that keeps the game at your finger tips. Hatoful Boyfriend is not the big-budget game that you will tell your friends about because it looks the coolest, but it is the mid-tier game that you can share some crazy stories with your friends about. There is not another game that let’s you fall in love with spy-birds, professor-birds and everybirdie while also telling a very intriguing story. While the music is hit and miss it does play a role with telling you how events are unfolding, and the anime art design is top-notch. Hatoful Boyfriend soars high with the best of them. MotoGP18 really stands out to me as a game that was tailored for all levels of play. I could easily get into it while still feel the joy and anxiety that competitive racing brings. I honestly can say that I enjoyed the game more each time I played it as I learned corners and turns of the tracks. The inclusion of leaderboards and three different campaigns means there is some replay value, but mostly this will be a game you either feel like playing or lack enthusiasm for. I for one found lots of interesting value with A.D.I.O.S and would like to see updates in the future to really make it worth your purchase.